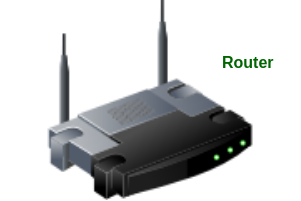 A Router is a networking device that forwards data packets between computer network. Let us understand this by a very general example, suppose you search for www.google.com in your web browser then this will be a request which will be sent from your system to the google`s server to serve that webpage, now your request which is nothing but a stream of packets don`t just go the google`s server straightaway they go through a series of networking devices known as router which accepts this packets and forwards them to correct path and hence it reaches to the destination server. A router has a number of interfaces by which it can connect to a number of host systems. Router receives the packets from its input ports, checks it header, performs some basic functions like checking checksum and then looks upto the routing table to find the appropriate output port to dump the packets onto, and forwards the packets onto that output port. Routing is the process by which the router ascertains what is the best path for the packet to reach the destination, It maintains a routing table which is made using different algorithms by the router only. This is the interface by which packets are admitted into the router, it performs sevral key functions as terminating the physical link at router, this is done by the leftmost part in the below diagram, the middle part does the work of interoperating with the link layer like decapsulation, in the last part of the input port the forwarding table is looked up and is used to determine the appropriate output port based on the destination address. Switching via interconnection network: This is a more sophisticated network, here instead of a single bus we use 2N bus to connect n input ports to n output ports. It executes the routing protocols, it works like a tradition cpu. It employs various routing algorithm like link-state algorithm, distance-vector algorithm etc. to prepare the forwarding table, which is looked up to determine the forwarding table.